The second two days training programme on 'Marketing of Financial Products and Services' was conducted by BAJK for its managers of 26 branches operating under jurisdiction of North Region (Muzaffarabad and Rawalakot Zones) on March 14-15, 2019 in Ch. Ghulam Abbas Learning Hall at head office. This training programme aimed to promote the knowledge of the participants in the area of marketing of Bank's Financial Products and Services in AJK and to equip the managers to compete other financial institutions effectively. The opening and closing ceremonies were chaired by the President of BAJK Mr. Imran Samad and were also attended by Divisional Heads. The President on this occasion advised the participants to apply the knowledge gained through this training programme in their work environment and also to disseminate it among other staff members for their benefit. He expressed his hope that this training programme shall create an impact inform of improved performance and significant increase in profitability of the Bank. The participants thanked the President for taking keen interest in their professional development and pledged to translate the knowledge in creating niche for the Bank in this market. At the end the President awarded the certificates to the participants. Bank of Azad Jammu and Kashmirs' 2 days training programme for managers of Muzaffarabad and Rawalakot Zones of North Region begins here on Thursday. The main purpose of the programme is to equip managers of BAJK with the knowledge of successful marketing of its financial products and services. The programme was attended by 26 participants. President of BAJK Mr. Imran Samad inaugurated the opening ceremony and delivered key note address on the occasion. He advised the participants to practice the learning from the programme in their work environment for promotion of business of the Bank. He assured the participants to arrange best possible training opportunities for them in future also. Bank of Azad Jammu and Kashmir (BAJK) has conducted a two days training programme for managers of Mirpur and Kotli zones of South Region here on March 09-10, 2019. The main purpose of the programme was to equip managers of BAJK with the knowledge of successful marketing of its financial products. The programme was attended by 28 participants. The participants appreciated the Presidents’ efforts in this regard and committed to avail this opportunity at maximum and to use the knowledge for development of Bank business vis-a-vis their professional carrier in banking. The 36th Board meeting of Bank of Azad Jammu & Kashmir was held here on Wednesday. Khawaja Daud Ahmad, Chief Secretary Govt. of Azad Jammu and Kashmir, who is also chairman of the bank’s board of directors, presided over the meeting. Initiating proceedings of the meeting, Mr. Imran Samad, President/CEO of the Bank highlighted important points regarding performance of the Bank. After thorough scrutiny/consideration, the Board approved the Bank Business Plan and Budget for the year 2019. The Board expressed its satisfaction and confidence over the Bank’s performance for the year 2018 and appreciated the steps taken by the management for promotion of the Bank’s business. It was hoped that the Bank will achieve all its targets during 2019. The meeting was attended by all BAJK Directors, Senior Member Board of Revenue GoAJK Mr. Fayyaz Ali Abbasi, Secretary Finance GoAJK Mr. Farid Ahmad Tarar, Secretary Industries GoAJK Mr. Abid Hussain Awan, Secretary Forests GoAJK Dr. Shehla Waqar, Chartered Accountant Mr. Ejaz Hussain Rathore, veteran Banker Raja Mumtaz Ali, Renowned Businessman Mr. Naveed Sadiq, besides Secretary Board Mr. Maazullah Khan, Chief Financial Officer Mr. Shahid Shahzad Mir and Divisional Head IT Mr. Ahtesham Malik. The President/CEO of the Bank Mr. Imran Samad while welcoming the honourable Prime Minister to apprise him the various steps taken by the management internally to promote its services and emphasise the importance of scheduling the Bank for taping unlimited potentials to make it one of the leading banks not only in Azad Jammu and Kashmir but also in Pakistan. Prime Minister assured all out cooperation for getting the scheduled status for the Bank. He lauded the efforts of BAJK in socio-economic development of the State and hoped that the Bank will continue playing its role to uplift the economic conditions of the people. He thanked the President/CEO for inviting him to inaugurate the ‘’Ch. Ghulam Abbas Learning Hall’’ and apprising him about the various initiatives taken by the management to expand the role of Bank. Muzaffarabad : November 28,2018 : The Board of Directors of the Bank of Azad Jammu and Kashmir held its 35th meeting under the chairmanship of Mian Waheed uddin, Chairman of the Board and also the Chief Secretary Government of Azad Jammu and Kashmir. President/CEO Mr. Imran Samad briefed the Board about business performance and strategy of the bank to march forward. The Board reviewed the financial position of the bank and expressed its satisfaction over the performance and growth in all operational areas of the bank and approved 3rd quarter accounts for the period ended September 30, 2018.The chairman emphasized the need to work with more dedication and devotion to further improve the profitability and image of the Bank. Board congratulated the Chief Executive on issuance of State Government’s Notification regarding change of title of Managing Director as President/CEO in line with the practice of the industry. The meeting was attended by BAJK Directors, Mr. Farid Ahmad Tarar Secretary Finance, Dr, Shehla Waqar Secretary Forest, Raja Mumtaz Ali veteran Banker, Mr. Naveed Sadiq Renowned Businessman, besides Mr. Maazullah Khan Secretary Board and Mr. Shahid Shahzad Mir Chief Financial Officer. Muzaffarabad : November 24, 2018 State Bank of Pakistan (SBP) on desire of President/CEO Bank of Azad Jammu and Kashmir (BAJK) Mr. Imran Samad, has organised training program for BAJK Branch Tellers here today. On the invitation of SBP the program was inaugurated by the BAJK as chief guest of the opening ceremony, which indeed is a great honour for BAJK. President/CEO BAJK is taking keen interest in training and developing Banks’ human resources for improving their efficiency and delivery of quality services to its customers which make them prepare for meeting present and future challenges facing the Bank and to develop it as model modern financial institution of AJK. 20 Tellers of the Bank benefit from the program. After completion of this training program the participants shall be able to serve customers in better ways and to promote the business of the state. The President/CEO during his inaugural speech expressed his gratitude to Chief Manager SBP Muzaffarabad, Mr. Muhammad Saleem Khan for arranging this important training and borne all the expenses of the program. Muzaffarabad : November 23, 2018 Bank of Azad Jammu and Kashmir (BAJK) with collaboration of Pakistan Credit Rating Agency (PACRA) has organised 2-day training program on Anti-Money Laundering and Risk Management at its headquarters Muzaffarabad from November 23-24, 2018 for its Branch Managers and Operation Managers. The program was inaugurated by the President/CEO BAJK Mr. Imran Samad. He in his key note address highlighted the need and importance of the program in prevailing national and global scenario. He appreciated the support of PACRA in organizing this program and impressed upon the participating officers to avail full opportunity of acquiring the knowledge about the subject and apply the same during their working to play full role in protecting Banks’ as well as national interest. Managing Director BAJK is now President/CEO BAJK. After passing the bill by Legislative Assembly of AJK, Government issued notification today. Mr. Imran Samad is the last MD and the first President/CEO of BAJK. While inaugurating 69th newly opened online Branch of the Bank of Azad Jammu and Kashmir at Kundal Shahi, Honourable Speaker Azad Jammu and Kashmir Legislative Assembly, Shah Ghulam Quadir reposed his hope that the state-owned entity Bank shall continue its march towards progress and success under the patronage of the state Government. He expressed his desire to uplift this Bank in equality with other national banking institutions of Pakistan. On this auspicious occasion supplications were offered for the progress and prosperity of both the state and the Bank. It is worth mentioning that among 69th branches of the Bank ,49 branches are providing online banking services to their customers. The Chief Guest appreciated the role of the Bank in Socio-Economic development of the people of the state. He further added that Government and Semi- Government departments are being directed to place their funds in Bank of Azad Jammu and Kashmir due to the increasing trust of the people in the Bank. He expressed his satisfaction that the performance of the Bank is satisfactory and therefore it is being recognized as an established institution due to delivery of the quality services and efficiency. He congratulated President/CEO of the Bank and his team who are striving their best to accelerate the pace of development of the institution. President/CEO of BAJK Mr. Imran Samad in his welcome address assured and retreated his determination to bring further improvement and delivery and quality services. District Administration, bank officials as well as the businessmen and local notables were also present. Rawalakot : On the instructions of Chief Executive Officer Mr. Imran Samad, Bank of Azad Jammu and Kashmir(BAJK) conducted here training program on Operations Management for operation officers of Rawalakot Zone the other day. The Program was attended by male and female officers and exhibited their keen interest in learning the various subjects included to cover their skill gaps to improve their performance. Chief Compliance Officer(CCO) Mr. Muhammad Afsar awarded certificates of attendance to all participants as CCO was the resource person of the program while GM Training Compliance Division Mrs. Raheela Javed coordinated the activities of the program. 15th State Bank of Pakistan Governors Cup: In its first match of 15th SBP Governor’s Cup Interbank Regional Cricket Tournament held at Narrol Cricket Stadium Muzaffarabad, the team BAJK defeated HBL North Group after a nail-biting encounter by 8 runs. Kotli: CEO BAJK Mr. Imran Samad presiding over a meeting with Managers of Kotli Zone. Mirpur, AJK: CEO BAJK Mr. Imran Samad presiding over a meeting with Managers of Mirpur Zone. Divisional Head Operations & HRMD Mr. Maazullah Khan, Divisional Head CAD&CMD Mr. Muhammad Akram Awan, CFO Mr. Shahid Shahzad Mir, Regional Controller South Mr. Hafeezullah, G.M Credit Mr. Tariq Mahmood Khan and Zonal Chief Mirpur Mr. Muhammad Arif Ch. are also present. Muzaffarabad: 15 September Bank of Azad Jammu and Kashmir at head office conducted two days training program on Operations Management for operation officers of Muzaffarabad Zone. BANK OF AZAD JAMMU & KASHMIR BOARD APPROVES HALF YEARLY ACCOUNTS August 28,2018. The Board of Directors of the Bank of Azad Jammu and Kashmir held its 34th meeting under the chairmanship of Mian Waheed uddin, Chairman of the Board and also the Chief Secretary Government of Azad Jammu and Kashmir. SMBR GoAJK, Mr. Fayyaz Ali Abbasi chairs Boards' Audit Committe Meeting. A briefing to Chief Secretary GoAJK/Chairman BAJK, Mian Waheed uddin by CEO Bank of Azad Jammu and Kashmir Mr. Imran Samad. Secretary Finance Govt. of AJK, Mr. Farid Ahmad Tarar Chairs 26th Meeting of BAJK Board of Directors Executive Committee. Secretary Finance Govt. of AJK, Mr. Farid Ahmad Tarar Chairs 25th Meeting of BAJK Board of Directors Executive Committee. CEO Mr. Imran Samad Chairs Assets Liability Committee (ALCO) meeting. Muzaffarabad :May 09,2018 The Board of Directors of the Bank of Azad Jammu and Kashmir held its 33th meeting under the chairmanship of Dr. Ijaz Munir, Chairman of the Board and also the Chief Secretary Government of Azad Jammu and Kashmir. Muzaffarabad : April 03, 2018 Bank of Azad Jammu and Kashmir (BAJK) opens its 68th full-service branch at Mang in Sudhanoti on Tuesday. Muzaffarabad : March 28,2018 The Board of Directors of the Bank of Azad Jammu and Kashmir held its 32th meeting under the chairmanship of Dr. Ijaz Munir, Chairman of the Board and also the Chief Secretary Government of Azad Jammu and Kashmir. Muzaffarabad: March 27, 2018 The Audit Committee meeting of Bank of Azad Jammu & Kashmir Board (BAJK) was held here on Tuesday. Mirpur Lions defeats Muzaffarabad Tigers in Bank of Azad Jammu and Kashmir Ist T-20 Inter-Zones Cricket Tournament final by 97 runs. The final was played at Narol Cricket Stadium Muzaffarabad . CEO BAJK , Mr. Imran Samad was the Chief Guest on the occasion. Kotli: Prime Minister of AJK, Raja Muhammad Farooq Haider Khan Inaugurates Bank of Azad Jammu and Kashmir's Lorry Adda Branch . The Board of Directors of the Bank of Azad Jammu and Kashmir held its 30th meeting under the chairmanship of Dr. Ijaz Munir, Chairman of the Board/Chief Secretary Government of Azad Jammu and Kashmir at Kashmir House Islamabad. The Board of Directors of the Bank of Azad Jammu and Kashmir held its 29th meeting under the chairmanship of Dr. Ijaz Munir, Chairman of the Board and also the Chief Secretary Government of Azad Jammu and Kashmir. The meeting was attended by Mr. Farid Ahmad Tarar, Secretary Finance, Mr. Fayaz Ali Abbasi, Senior Member Board of Revenue, Syed Zahur-ul Hassan Gilani, Secretary Forests and AKLASC, Raja Amjad Pervez Ali Khan, Secretary Industries, Mr. Ejaz Hussain Rathore, Director, Raja Mumtaz Ali, Director, Mr. Naveed Sadiq, Director, Mr. Maazullah Khan, Secretary Board and Mr. Shahid Shahzad Mir, Chief Financial Officer. Managing Director/CEO Mr. Imran Samad while welcoming the new inductees into the board briefed in detail the performance and strategy of the bank. The Board reviewed the financial position of the bank and approved the financial statements for the half year ended June 30, 2017.The MD also briefed about various steps taken by the management to promote the business of the bank which included formulation of business strategy, introduction of state of the art Information Technology, updation of all policies, training and development of human resource etc. 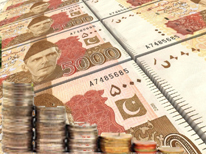 , which are considered prerequisite to comply with the State Bank of Pakistan rules and regulations. The Chairman appreciated the steps taken by the MD and expressed his satisfaction. He also advised that management should continue its efforts for rapid progress of the bank. During the meeting the Chairman applauded the bank’s contribution in socio-economic development of the state. MD/CEO assured the Board of taking all the necessary steps with commitment and dedication to develop the bank . Muzaffarabad: Chief Secretary and the Chairman of the Bank of Azad Jammu and Kashmir Dr. Ijaz Munir inaugurated the launching of the new official website of the Bank of Azad Jammu and Kashmir(BAJK) the other day. While lauding the efforts of the Managing Director Mr. Imran Samad for taking several innovative steps in the bank in short period of time including airing the internally developed website to improve business and brand image , chairman pointed out that the results of the efforts made by the bank are quite visible. 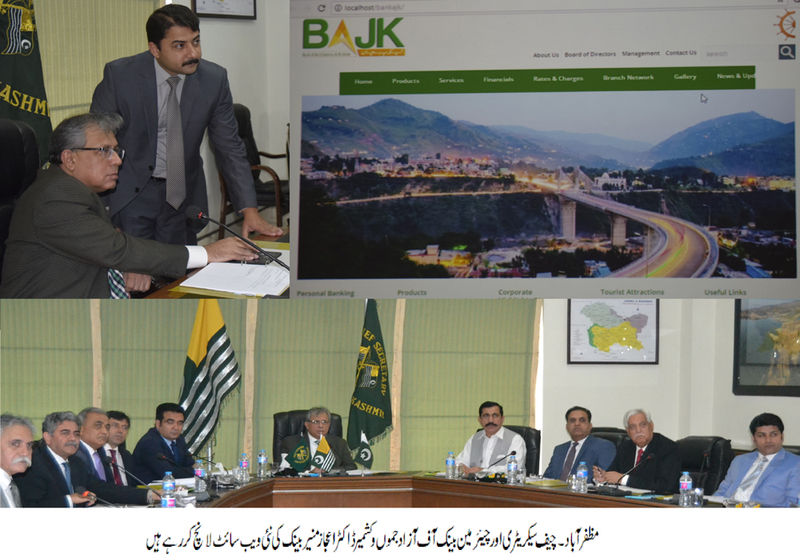 Mr. Ahtasham Malik , Divisional Head IT briefed that website of the bank, www.bankajk.com, is developed by BAJK’s own IT Division, which contains many unique features to assist Bank to improve its functions and also helps in promoting State’s Tourism and other sectors. The BAJK is the only bank in the country which has Google maps integration with branch locator at its website interface. The Directors of the Board Mr. Farid Ahmad Tarar, Secretary Finance, Mr. Fayaz Ali Abbasi, Senior Member Board of Revenue, Syed Zahur-ul Hassan Gilani, Secretary Forests and AKLASC, Raja Amjad Pervez Ali Khan, Secretary Industries, Mr. Ejaz Hussain Rathore, Director, Raja Mumtaz Ali, Director, Mr. Naveed Sadiq, Director, Mr. Maazullah Khan, Secretary Board and Mr. Shahid Shahzad Mir, Chief Financial Officer were also present on the occasion. BAJK launches SMS Alerts Services for all its customers of 65 branches in 10 districts of AJK. With SMS Alerts service, customers of the Bank will be informed of multiple account transaction(s) on their mobile phones within minutes. BAJK has a wide range of products and services, looking to provide customer convenience by offering innovative and value-added products and services. The launch of the BAJK SMS Alert service is one such example. The essence of this service is to provide added convenience and security to all BAJK customers and would be helpful in assisting them for monitoring day-to-day account activity. BAJK customers will receive an instant SMS alert from BAJK on their respective mobile phones on any of the following transactions that occur on the customer’s current or savings account(s): • Debit Transaction: When an amount is deducted from customers’ current or savings account(s). • Credit Transaction: When an amount is deposited to customers’ current or savings account(s). Prime Minister Government of Azad Jammu and Kashmir, who is also the chairman Bank of Azad Jammu and Kashmir, presided over 28th meeting of Board of Directors of Bank of Azad Jammu and Kashmir the other day. Managing Director/CEO Mr. Imran Samad briefed in detail to the members regarding banks’ achievements during first quarter of the year 2017. During the meeting directors reviewed the financial position of the bank for the year 2016 and first quarter of the current year. During the meeting board approved the Business Plan 2017 of the bank. The board was also briefed about the various steps taken by the management to promote the business of the bank which included formulation of business strategy, introduction of state of the art Information Technology, formulation of policies, training and development of human resource etc., which are considered prerequisite to comply with the State Bank of Pakistan rules and regulations. The board was apprised about establishment of two important divisions i.e. Credit Administration Division (CAD) and Special Assets Management Division (SAMD) in line with the requirement of modern banking. The chairman appreciated the steps taken by the MD and expressed his satisfaction. He also advised that management should continue its efforts for rapid progress of the bank. He also directed that latest Information Technology be inducted in the bank for providing excellent services to the customers. During the meeting, the chairman applauded the bank contribution in socio-economic development of the state. MD/CEO assured the board of taking all the necessary steps with commitment and dedication to develop the bank under the supervision of Prime Minister/ Chairman of the board. Dr. Mohammad Najeeb Naqi Khan, State Minister Finance, Planning and Development, Public Health, Dr. Ejaz Munir, Chief Secretary, Mr. Ehsan Khalid Kiani, Principal Secretary, Mr. . Fayaz Ali Abbasi, Senior Member Board of Revenue, Syed Zahur-ul Hassan Gilani, Secretary Forests and AKLASC, Raja Amjad Pervez Ali Khan, Secretary Industries, Mr. Ejaz Hussain Rathore, Chartered Accountant, Mr. Maazullah Khan, Secretary Board and Mr. Shahid Shezad Mir, Chief Financial Officer were also present in the meeting. Muzaffarabad: Bank of Azad Jammu and Kashmir conducted a specialized operational training for its employees at Rawalakot, which was the last session of a series of such programmes arranged for the entire bank. According to a statement issued here, the two-day training programme focused on enhancing all aspects of branch operations. Training programmes were designed to ensure the improvement in knowledge and skills of the participants to improve their efficiencies and to serve the customers more effectively. Managing Director Imran Samad while concluding the training sessions advised the officers to serve the bank with dedication and commitment, without which the development and progress of the bank can hardly be achieved. He also emphasized that the officers should observe banking rules, regulations and processes in performing their duties. Managing Director awarded certificates to the participants. Chief Compliance Officer Abdul Hameed Raja, who supervised the training programme, thanked the MD for motivating the participants by sharing his vision and strategy for future growth of the bank.